The holiday season invites a celebration. Just before holidays, Grade 3 – 7 students at Tecumseh headed to the gym for the 3rd Reading Extravaganza of the year. Kids were excited and clutching books in their hands. Some of the books were from classroom collections. Some were from the library. Some books were from home and being brought to trade for some new books to add to personal libraries at home. The common element was that all of the kids were VERY excited about going to the gym to read for an hour. It begs the question, what are the things that have allowed the act of reading to generate such excitement? There is no real magic in creating readers. Create opportunities for positive memories of reading. Teach the skills for children to decode and understand text. Provide access to engaging fiction and non-fiction text to pique interest. Students come to school with a variety of experiences with text. Fortunately sharing stories with children has become a regular part of primary classrooms and many intermediate classrooms. It has become a way to get to know students and stimulate curiosity, as well as to teach reading comprehension skills. In many schools such as ours, we have programs such as One To One Readers, which allow children to develop emergent skills and relationships with volunteers who are there because they love books and the kids they are working with. Reading becomes an enjoyable venture where you can learn about things or characters that you care about and share a laugh or two. Children are also encouraged to read throughout the school for a variety of purposes and in a variety of spaces. The lawn chairs by the Christmas tree were much sought after this season as a place to read. At the Reading Extravaganza, gymnastics and yoga mats were pulled out and all children carefully removed their shoes before getting cozy on the mats. Benches pulled into shapes, lawn chairs and blankets were equally captivating spaces to read. With 350 students reading in a gym, it may surprise you that students actually engaged in reading. We did have some conversation about what reading behaviours look like. There was some good discussion around the differences of what people want when they read. The desire to share a good part or laugh out loud, means that the environment is not going to be silent. However we also discussed how we could be respectful to those readers not wanting to be interrupted. The trade a book opportunity happened first with students surrendering the books they wanted to trade for popsicle sticks and then trading in their popsicle books for new books. Some children brought books to give away too. I was also giving away many of the bookmarks and freebies from conferences and much of my classroom collection due to my impending move to another school. Students demonstrating the reading behaviours we discussed were given popsicle sticks by the adults in the room to go pick a book or other reading item. Most of our students have learned to self select books that interest them, but the students shopping for selections helped each other with favorite picks. In some cases, students were choosing books they wanted to give to siblings or cousins or friends for Christmas. 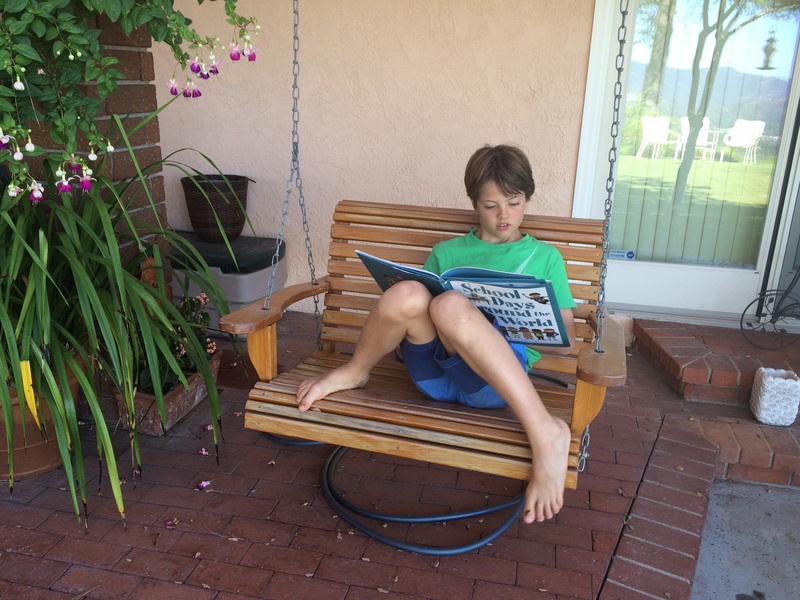 As a reader and an educator, my heart warms to see kids engaged and enjoying reading. Give them books and opportunities to read and they will come and have fun! On December 10th, 2015, Tecumseh Elementary School paused to celebrate Human Rights Day and to consider the plight of Syrian refugees. If you had a chance to read the Welcoming Syrian Refugees blog (Dec. 2015), you will remember that Marion Collins was reading Hannah’s Suitcase with her students and we had the idea to create peace art with the old wooden suitcase that my paternal Grandmother brought to Canada in 1947 to start a new chapter of life with her four young children. With the help of the grant from Promoting a Culture of Peace for Children Society, the suitcase has become an inspiration for representing ideas through art, reading, writing, listening, speaking and caring. One side of the suitcase is decorated with messages of welcome to the Syrian refugees. The other sides are decorated with Jackson Pollock inspired art by Grade 3 students. Each colour represents each individual in Canada with all of our similarities and differences. The finished masterpiece is the representation of all of us coming together to create something beautiful. Tanya Conley’s students also made flags of the countries of origin of Tecumseh students and of the suitcase. 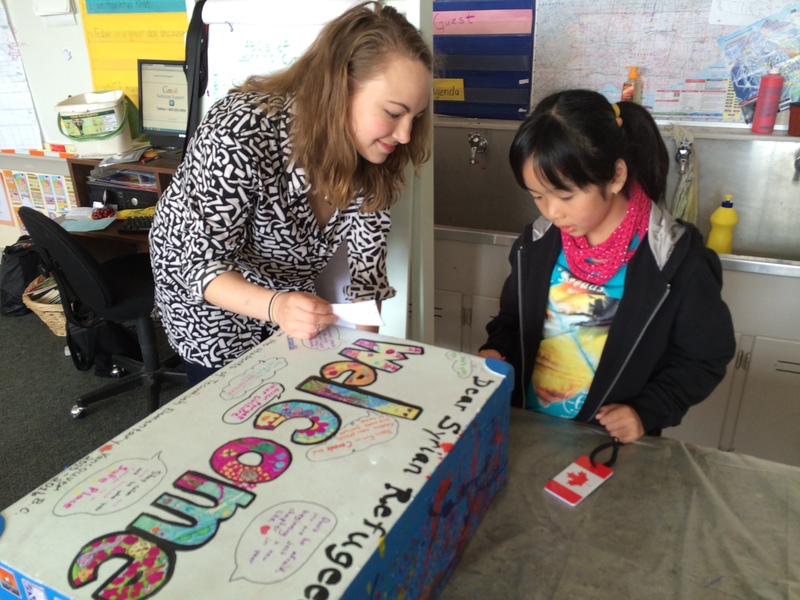 A local artist, Larkyn Froese, came into help the Grade 3’s with applying the flags on the project. Grade 6 students wrote messages of welcome on fabric squares and sewed them on items of clothing to be displayed coming out of the suitcase. The artwork became a catalyst for more questions and an inspiration for the reading and writing of Tecumseh students. With the help of a grant from ReadingBC (The British Columbia chapter of the International Literacy Association –ILA), Ms. Collins continued to expand the project to include a literacy component with the entire school. The experience of leaving home and family behind is a difficult experience as an immigrant and as a refugee. Many of the parents in our school community have given up good jobs in their home country and work hard, often with more than one job, to provide better opportunities for their children in Canada. Ms. Collins spearheaded a writing project with intermediate students to interview their parents and discover family stories of hardship and triumph. Several albums have been filled with the interviews and photographs for display with the suitcase. This same family history vein was pursued by Ms. Conley’s HumanEYES art based initiative that celebrates the diverse life experiences of young people throughout the Vancouver, Coast Salish ancestral lands. This project documented inter-generational and inter-cultural storytelling and celebrates the importance of family and maintaining cultural roots. The project culminated with an intergenerational cookbook filled with recipes, art and family photographs of her 4th graders that has been included in the suitcase as well. Ms. Collins, her enthusiasm and the desire of staff to get involved resulted in almost all of the classrooms in the school taking part in the project. Several classes stopped to consider the notion of taking flight in war-torn areas with very few belongings. They learned many refugees leave home with a house key in the hope their home will survive the war or as a memory of what was. Several intermediate classes of students designed hamsa hands, an old and still popular amulet for magical protection from the envious or evil eye in many Middle East and North African cultures. They created keychains with the hasma hand, a key and a fimo sculpture of what they pack if they needed to leave home in a hurry. Primary students wrote and drew about what they would bring and have created albums of their ideas for inclusion in the suitcase as well. The #WelcomeSyrianRefugees project was first featured at the United Way luncheon for Syrian Refugees that was hosted at Tecumseh Elementary school this Spring. The most common reaction from the adults viewing the project has been tears. In the barrage of negatives on mainstream media and social media, there is comfort that Canadian children are welcoming their Syrian children with open arms. There is also the hope that there are many Canadian adults who are doing exactly the same thing. Note: The title #WelcomeSyrianRefugees came from the Twitter handle of the same name that expresses messages of welcome not just to Syrian refugees. This project will be on display at the Vancouver School Board during July and August 2016. Our goal is for it to be displayed at a variety of venues as a way to warmly welcome refugees as they begin a new chapter of their lives in Canada. Richard Wagamese calls it. It’s up to us to create “the best story we can create while we are here”. The celebration of relationships with the earth, family, community and spirits as well as the embedding of history and survival techniques in story is what sustained our First Nations people for thousands of years pre- contact. The importance of embedding story in curriculum has been explored extensively by Kieran Egan at Simon Fraser University and has become a mainstream truth. What is new, is the rediscovery of the fact that embedding memory and history in story to make it meaningful is part of the legacy handed down to our current society by First People’s cultures. Learning about and acknowledging and integrating these foundational truths from First Peoples cultures is how we can truly reconcile our relationship with Indigenous people that has been seriously compromised in the process of colonization and the subsequent quest for economic advantage. The First Peoples Principles of Learning were written by fnesc (First Nations Education Steering Committee) and the British Columbia Ministry of Education . Laura Tait did an amazing talkat The Changing Results for Young Readers Conference in 2013. It’s well worth listening to her 15 minute presentation, complete with pictures and stories from her family and Tsimshian community to bring life to the words. For me, the concept that bounced out was the acknowledgement of more than one way of looking at the world. Imagine the wars based on religious intolerance that could have been averted if we had been able to grasp this concept. I think of all of the time it took me to grasp the concept of “sister- cousin” from my Indo-Canadian students. And for me it should have been easy. I grew up with a cousin who was more like a sister and even lived in the same house for a chunk of time. When I finally “got it”, I had to tell Babita, the student who persevered and patiently explaining the relationship of “sister-cousin”. She had persisted with the idea despite my insistent references to the definition of the word cousin. Her eyes were filled with the delight, or was it relief, of a teacher when a student finally understands the seemingly easy concept that has eluded them. It didn’t just take my willingness to try to understand but her patience and perseverance in hanging in there with me on the journey of discovery. We hold on to these little successes along the way. To end where we began, with the words of Richard Wagamese: “We change the world one story at a time.” Babita changed mine. The BC Literacy Council of the International Reading Association (BCLCIRA), commonly known as ReadingBC, has long been committed to improving student engagement in books and proficiency in literacy. Members read journals such as The Reading Teacher, Journal of Adolescent and Adult Literacy, attend conferences and get together to discuss things they have tried in their classrooms and communities and the things they’d like to try. Coming together with people with like minds is an energizing experience and lends itself to reflecting on practices that are tried and true and substantiated with research in the field. Members have readily embraced The International Literacy Association’s quest to start a worldwide Literacy Movement. 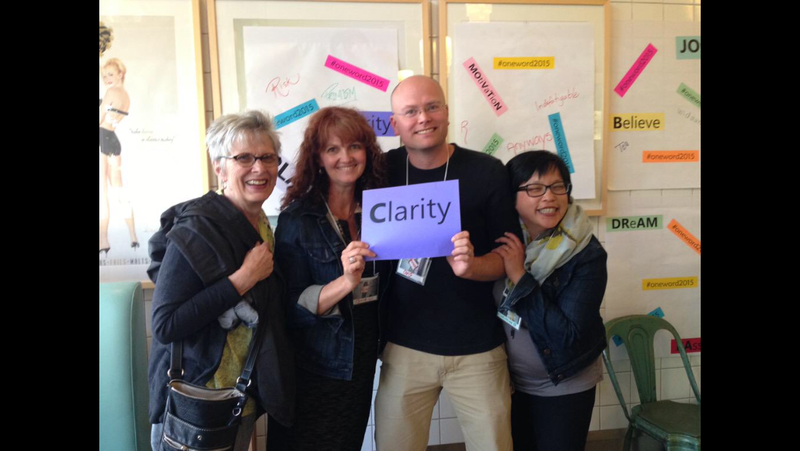 For the 2015-2016 year, Reading BC (BCLCIRA) is trying to broaden participation and the diversity of ways that literacy leaders in British Columbia can engage with other literacy educators both in person and online. While it is increasingly difficult to organize and facilitate larger scale meetings due to high costs and increasing demands on our time, the ReadingBC executive committee has come up with some exciting opportunities to develop a variety of possibilities to engage in professional development and engage in community focused projects to advocate for literacy. Join a ReadingBC Book Club. Choose one of the books selected by members. Form a book club with peers. Participate in the discussion about a Book Club selection with colleagues via a TWITTERCHAT. 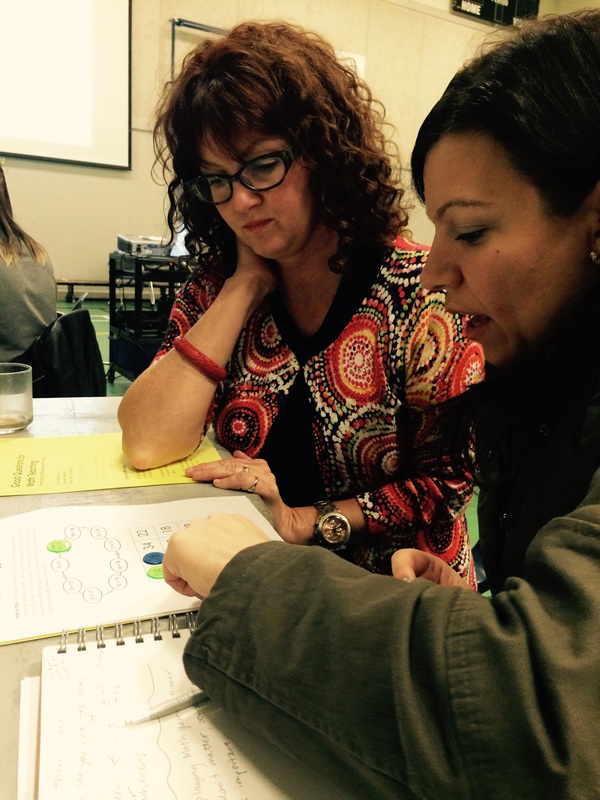 Read Spirals of Inquiry (Judy Halbert & Linda Kaser) and decide on an inquiry question to pursue with a group of colleagues. Form a ReadingBC Community action focus to encourage children to engage in literacy activities or educate parents. Form a Literacy Committee if you have a well established group wanting to commit to regular professional development and advocacy in your area. Check out the link below for ideas BCLCILA Projects.final (3) copy and opportunities to join the International Literacy Association . If you are a member of the International Literacy Association and live in British Columbia, you currently have a free membership to the provincial chapter, BCLCIRA / ReadingBC. We have designated funding to help members get started from a grant from the Lower Mainland Council of The International Association (LOMCIRA), a local chapter before it went into dormancy. Please check out the opportunities and send applications for funding or questions to the provincial coordinator at carriefroese@gmail.com or any of the other contacts on the website. Hopefully this will forge some of the connections to continue building a community of literacy learners in British Columbia, and perhaps beyond. gymnastics skills and presenting practised, low pressure oral readings of text to parents. Sounds pretty basic. I do find the process is easier on the iPad than on the computer but that could be because I’m more familiar with it. Dylan’s best advice was to BE ORGANIZED. The events folder is a good idea to hold content such as pictures, videos, voice-overs and other audio clips. The entire Apple team was very helpful and invaluable for their trouble shooting. 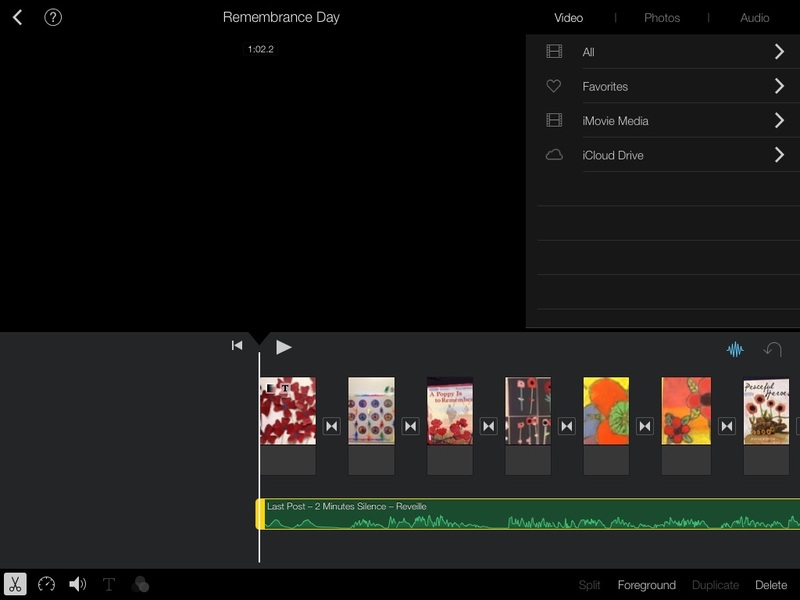 A fantastic online discovery has been the iMovie Trailer Planners. 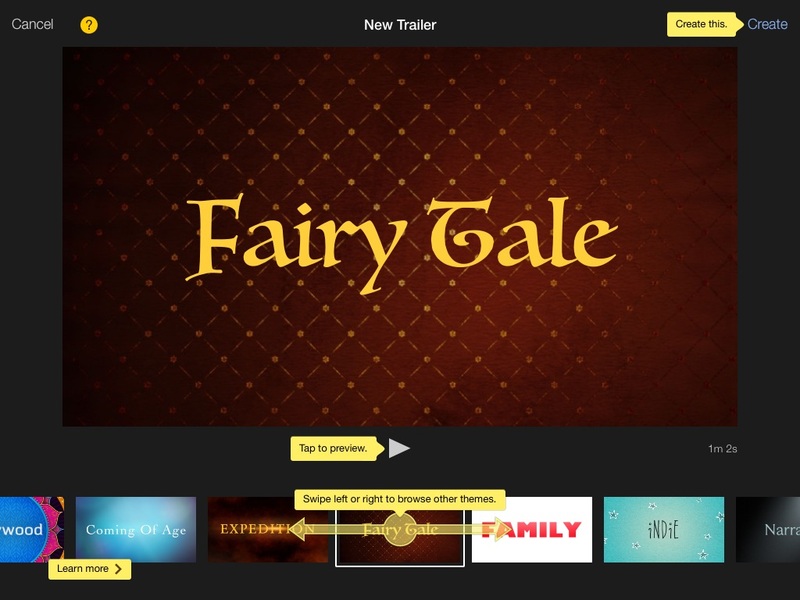 It provides the structure to help students storyboard their movies with fillable PDF’s for all 14 trailer templates that are included in iMovie for iPad, iPhone and the iPod touch. The planning sheet helps students to decide the appropriate trailer for the content and mood of the material being shared. The results are very professional looking and the limited amount of text requires careful selection of images. The sample of The Giver demonstrates how effectively the trailers can be used to demonstrate understanding of texts. Certainly a more engaging project than the book reports that I did in school. Virginia Bowden used the narrative trailer to have her gifted students to do autobiographies last year. Even the 4th graders came up with impressive results. I am looking forward to sharing this material with VSB Teacher Librarians at their Kick-off/ Orientation / Speed Geeking event. 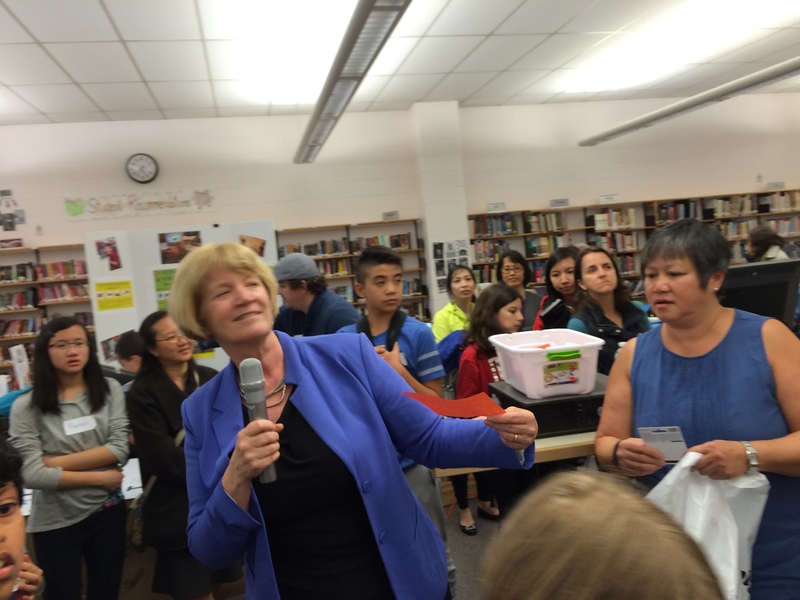 It’s exciting that so many teacher librarians in the Vancouver School Board are enthusiastic about using technology to engage Kindergarten to Grade 12 students. 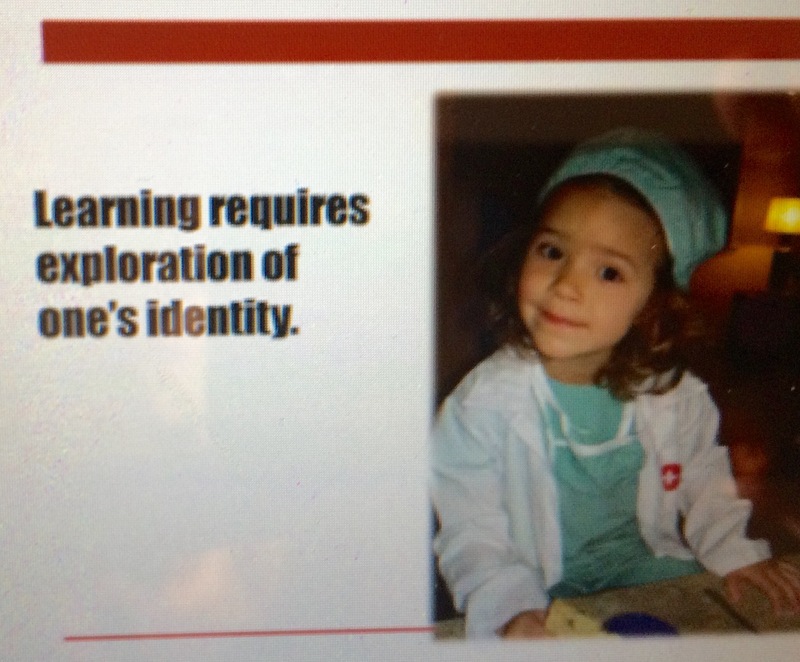 I’m also excited about continuing the learning and discovery of possibilities with students and colleagues this year. Gabriel and Rose Pillay pull off another stellar event for educators At Moderne Burger on Broadway. One Word. An Ignite Night with a bit of a twist. Created by twitter or popularized by it? Not too sure. Participants are the presenters. An Educational Paradigm. A personal philosophy. All good as long as you can nail it down to one word and explain it in 120 seconds or less. I didn’t quite get mine out in the 2 minute time frame so here it is. The list could go. Both personally and professionally, it’s the stretch that pushes me to the thrill of new learning. I suppose we all fall into comfortable spaces where we feel safe and successful. Venturing out of that comfort zone risks failure. I have discovered that the definition of failure is largely a set up dependent on my own expectations of myself. The sting of failure may be personally humiliating. The embarrassment daunting. The injustice palpable. However the advantage of experiencing failure is you realize that it won’t kill you. The advantage of the risk is that you push yourself to do something that you never quite imagined. I loved the first school I worked at in Abbotsford. A little primary school with a tight knit staff that worked closely on literacy initiatives and song experience games, hands on Science and supported each other personally. When I left that school for the first 6 months, my friend’s husband would say “Dormick Park”, and I’d cry on cue. However I also learned that with every change to a bigger fish pond, I learned new things personally and professionally. Teaching in China taught me to pay more attention to cultural differences and a healthy respect for my students struggling to learn English. Entering the world of technology taught me very quickly that I needed to move beyond texting “y” for “yes”. “N” for “No” and “P” for “Phone me right now.” I don’t get bored. I just try something new. Today – One Word Burger. I wish the same kind of risk taking and the same thrill of new learning for my colleagues and my students. My word – RISK. 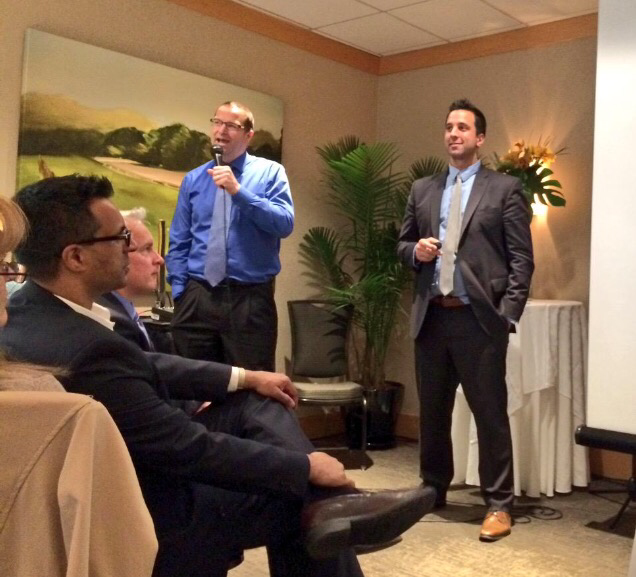 Teams were pulled up the the mic to present together. Clarity was for those of us with names starting with “C”. Sense of team was foraged quickly! Fun event. The only thing I’d do differently would be to hold people to the 2 minute time limit. Perhaps a big horn or my hand bell 🙂 Great group of people. Great collection of ideas. Great burgers and milkshakes – Thanks Moderne Burger! 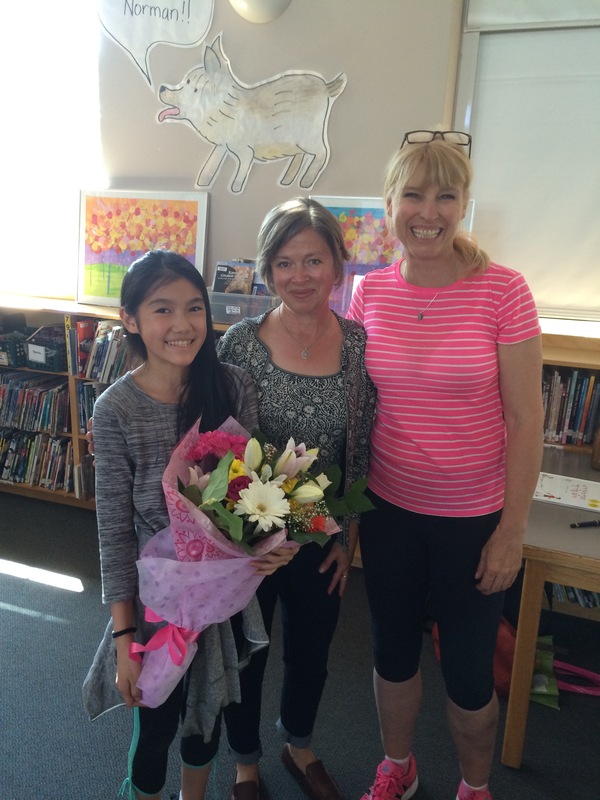 Caroline Adderson welcomed student representatives from all of the elementary schools in the VSB to a celebration of literacy along with their librarians and principals or vice-principals. 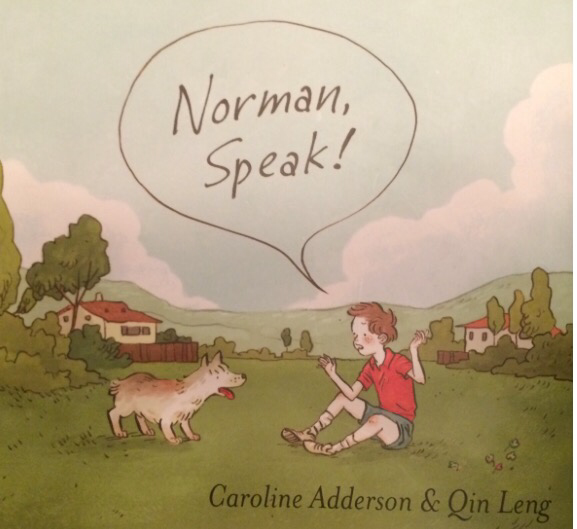 “Norman Speaks” was the book selected by the Vancouver Elementary Principals Vice Principals Association (VEPVPA). Each year the VEPVPA “Celebrating Literacy Committee ” selects a book. The Association invites the author to share the story with students and then puts the autographed book into the one hundred VSB elementary school libraries in Vancouver. “Norman Speak” was selected for the storytelling and the illustrations in the picture book, as well as the story itself. Caroline Adderson fascinated both groups with the story of the dog who inspired the story, a real dog that really only understood Chinese. The book explores the assumptions that young and old people make when someone does not speak the language. Something wise to be talking about in a city like Vancouver, where so many people speak English as a second or third or fourth language. Caroline was an amazing presenter – a prolific author with teaching experience! She had us all engaged in grappling with the task of trying to speak another language. She also shared a video clip with the illustrator, Qin Leng, discussing how she approached doing the illustrations. The students were amazed to learn that the authors and illustrators don’t usually meet until after the drawings are done, if ever. Ben reports that the highlight of the event was having books and pieces of paper signed by the author. More than one students reported that the dog shaped chocolate was the best part. The was truly a wonderful illustration of how books can help us to adopt another perspective and delight in the experience.